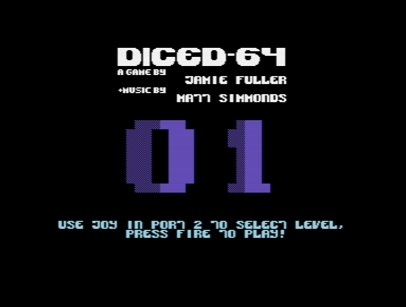 Diced-64 was based on an android game I wrote with the same name (Link) It was designed to be less thank 4K in size as I was thinking of entering it into the craptastic compo but I thought the game was a bit too serious for the compo. The idea of the game is to clear the game area of dice, on the right hand side of the screen you are givven a "NEED" value, this is the number of the dice that you must match to remove them. You can select any number of dice, either horizontally or vertically BUT NOT DIAGONALLY, if the total of the faces match the number needed, they will dissapear. Complete the game to find the QR-Code to the web address of the completions table, where you can enter your name for the scoreboard. Use joystick in port 2 to control the cursor. 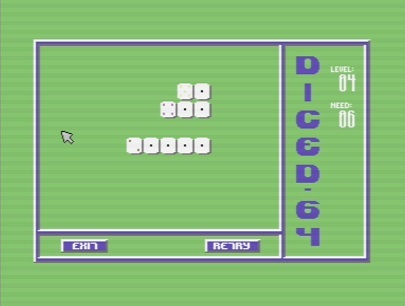 press and hold the fire button to select a dice. While holding the button you can move left/right up/down to select multiple dice.